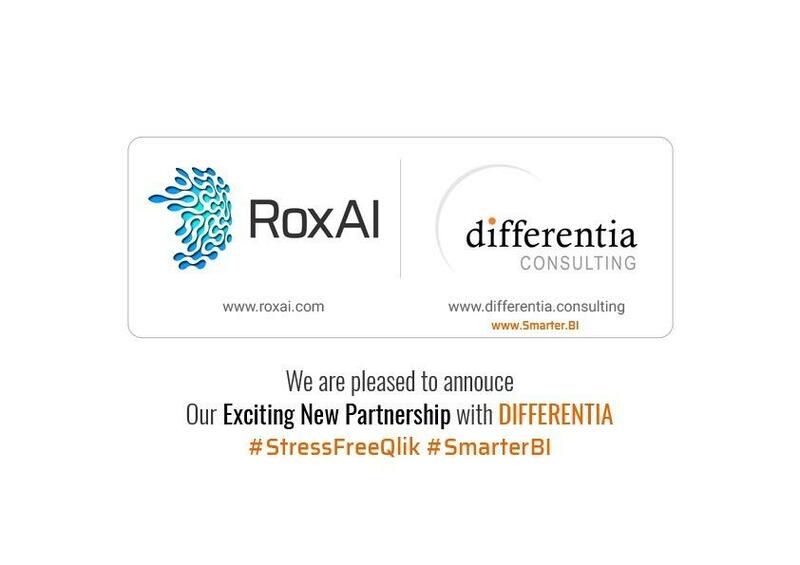 Stokenchurch, Nov 2018 – Differentia Consulting a leading provider of business intelligence solutions to the UK market, today announced that they have agreed a strategic alliance partnership with software developer, RoxAI. RoxAI, based in London. RoxAI’s dedicated team have a broad set of skills in disciplines of Data Science, AI Development, Computational Linguists, Blockchain, Analytics and Web Development.. The appointment of RoxAI as a Partner will allow Differentia to extend their Qlik tools offerings enabling new functionality such as alerting for Qlik Sense that will drive productivity. The value of such technology cannot be underplayed. Qlik has been deployed into mission critical situations at many organisations and the need for speed, is ever present. RoxAI is a great partner to service this need. Adrian Parker, SVP at Differentia, said: “Data and people are at the heart of every company. Providing our customers with the right data management and analytics platform as well as tools can improve efficiency and increase productivity. Partnering with RoxAI and Ping Intelligent alerting will enable our clients to become more reactive to situations that require their input. Differentia Consulting are a Qlik Elite Solution Provider servicing the requirements of over 300 clients. Established in 2002 Differentia Consulting has an ERP heritage which supported the move into the Enterprise Data/Analytics/BI space, with Smarter.BI …powered by Qlik. For more information please contact marketing@differentia.consulting and follow us on Twitter @DCLUK.